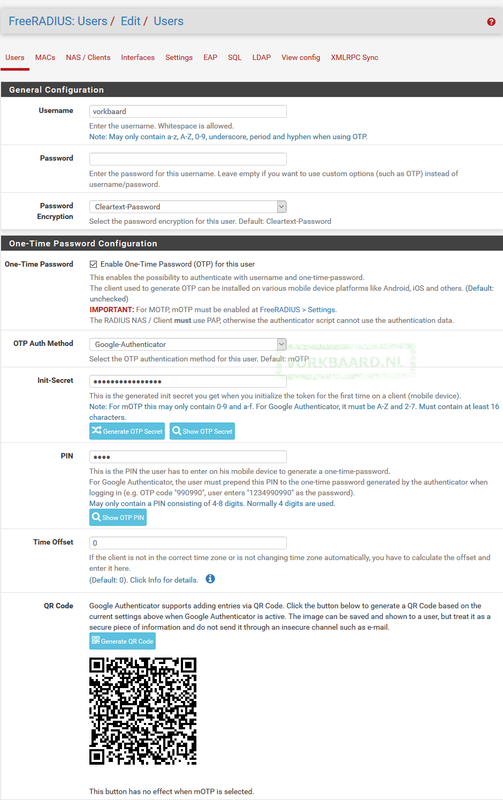 This article explains how to set up OpenVPN with Google Authenticator on pfSense. I’m using pfSense 2.4.2 but the method shouldn’t change much. If you follow along you’ll end up with a VPN server that asks for the user’s username, a pre-set PIN (4-8 numbers) and a one-time generated code from Google Authenticator on your phone. The PIN + the OTP will be the user’s password. I will not explain the inner workings of Google Authenticator or OpenVPN on pfSense. Other articles on my site can help you set up OpenVPN on pfSense. (Follow this one but skip the Active Directory part.) This will not work if you use Active Directory to authenticate VPN connections; you would need OTP on AD or some other method to achieve that. 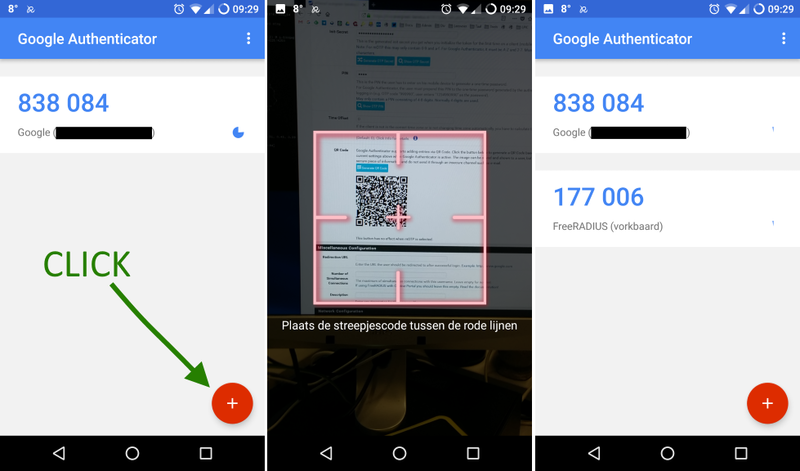 – have your phone with Google Authenticator. Every step is followed by a screenshot, so text first, picture next. Install the FreeRADIUS package from System > Package Manager > Available Packages. Add a NAS client (pfSense’s User Manager is the client). Client Shared Secret think up a passphrase. Shared Secret enter your passphrase here. PIN enter 4-8 numbers and remember them. QR Code click Generate QR Code. At this point open Google Authenticator on your phone and click the + sign to add a service and select ‘Scan a bar code’. Then scan the QR code. You may need to install a bar/QR code scanner first. Afterwards you may rename the entry. Miscellaneous, Network and Time Configuration, Traffic and Bandwidth and Advanced Configuration can all be empty and except for Time Configuration I don’t think they would have any influence on the VPN. Verify you can log in with Diagnostics > Authentication. It should say ‘User vorkbaard authenticated successfully.’ If it doesn’t, check under Status > System Logs > System > General. In the OpenVPN Server configuration choose localfreeradius as the Backend for authentication. 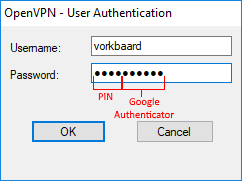 If you connect your OpenVPN client you must enter your username and the PIN + the Google Authenticator one-time code as your password. One more thing: OpenVPN renegotiates the authentication every 3600 seconds. But a Google Authenticator code is only valid for 30 seconds. So then renegotiation will fail and you will be disconnected and asked to re-enter your password (your PIN + your current Google Authenticator code). That’s ok and it works but you may want to change that behaviour. The relevant setting is reneg-sec and you must set it to the number of seconds after which you want the negotionation to occur. 3600 is the default but you could set it to a higher value like a day. Use 0 to disable it altogether. Here I’m using 0; use however many you like. Keep in mind that this value is used at the client and the server and the shortest value counts so you must change both. – Under Client Export > Advanced > Additional configuration options also add: reneg-sec 0 (click Save as default if you don’t want to add it manually every time you export a config). Thank you for the detailed write up. Was somewhat stuck w/ the 2FA bit but then I found your article. Very much appreciate it! I would LOVE if you added to your instructions explaining what/why some things are done/needed. It would really enrich the experience. For instance: The very first thing you say is to add Interface address. Why that specific address, etc. Thanks and I’ll try to set it up and see what happens. Hi Lorne, there’s a link in the second paragraph of this article to one that does just that. This is just an addendum. Okay, so far all seems pretty straight forward until I get to the last set of instructions. VPN/OpenVPN/Server/Edit: You talk about General settings and the reneg-sec 0, but you left out all of the other settings. Cryptograpic settings, Tunnel settings, Client settings, Advanced client settings. Assuming that is all default, produce and error of The selected certificate is not valid, and The field IPv4 Tunnel network is required. There are so many settings that describing all of them would be to reproduce the PfSense Manual. Most of those are preferences. This article is meant to explain how to add Google Authenticator to an already working vpn implementation on PfSense. It says so right in the beginning. Follow-up. I’ve used this page many times so thank you. However, I’ve just run into some followup info. 2.4.4 is out now and there are some changes. 1. 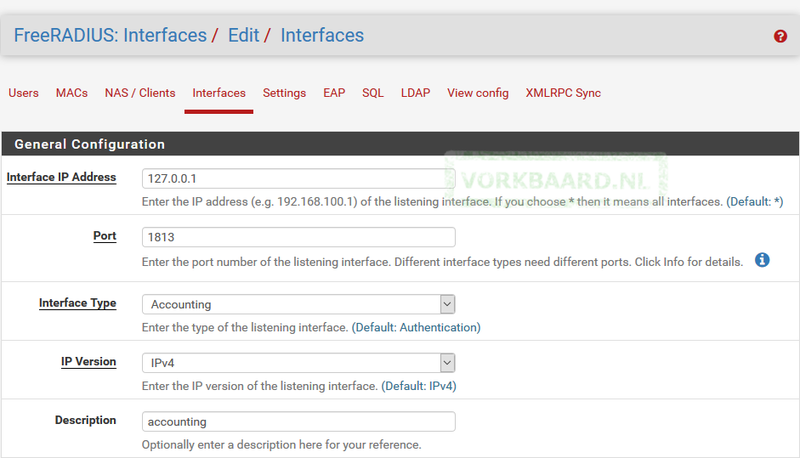 In System/User Manager/Authentication Servers: there is an additional box that is not intuitive. The last line has added: “RADIUS NAS IP Attribute”. Your choices are what ever ports you have. The assumption is there is WAN and LAN. 2. All of a sudden my dyndns is not updating, so i suspect a problem with the update and I’m still researching that. Hi Felipe, this sounds for a fun holiday project. Unfortunately for me there is no holiday in sight. Perhaps later this year! Thanks for the contributions. 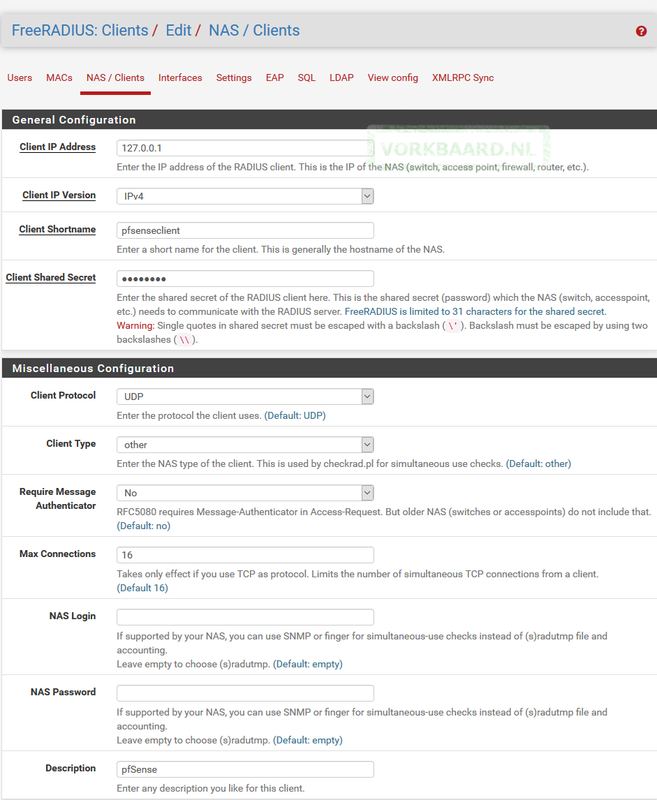 I would like to know how to make a project using PfSense’s FreeRADIUS3 LDAP, in which it connects to the Active Directory server and uses it as authentication for the captive portal. if someone is facing this probem: Warning: [/usr/local/etc/raddb/mods-config/attr_filter/access_reject]:11 Check item “FreeRADIUS-Response-Delay-USec” found in filter list for realm “DEFAULT” after going through the manual I have a solution that worked for me. Cert Manager -> Certificates -> Create a server type cert for Free Radius and link it to the default FreeRADIUS CA. Go to Services -> Free Radius -> EAP -> SSL CA should be the defaut one (FreeRADIUS CA). Then for Server SSL Certificate set the newly created server type cert. Test in again in Diagnostics -> Authentication.